The thing about working at ModCloth is that you’re surrounded by a bunch of people who share a similar aesthetic. And everyone has an employee discount. And so, invariably, one day you come into work and you’ve got a twin! Hannah, Rocky, and me. Photo by Santina of Style by Santina. This was totally unplanned, but funnily enough it was about a week after we had a “Seeing Double” day, where Hannah and I purposefully wore the same outfit as each other (but a different one from this). 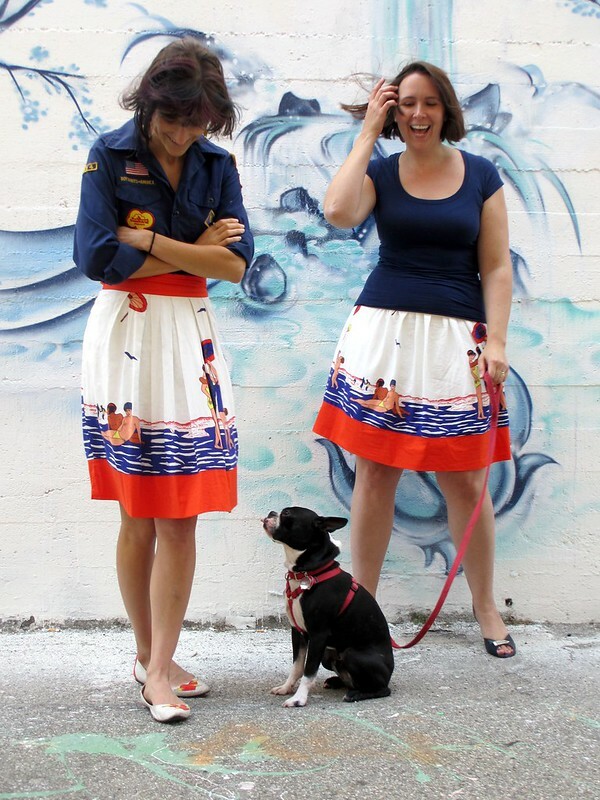 Rocky looks like he’s chiding Hannah for daring to wear the same skirt as his human! He’s going to WOOF at her! It is a gorgeous skirt so I can see how this could happen. It’s nice to see it styled differently. Haha, he’s totally sticking his tongue out!